I’ve just come back from 4 weeks studying in Granada and it’s by far the most stunning Spanish city I’ve been to! I really loved every minute there. It’s unlike anywhere else – You realize this from the minute you arrive, with the incredible Arabic palace “La Alhambra” towering over the city, and the snow-capped Sierra Nevada Mountains behind – You just know you’ve arrived somewhere special! There is also the stunning Albaicin area, the old town, in which there are a series of old narrow streets with typical old buildings and Moroccan stalls and Moroccan tea houses….where you get a real feel for how Granada would have been right back in the time of the Arabs. Serene yet full of life, ancient and truly awe-inspiring … how I loved Granada! I had the best time there! When I visited Granada, I soon realized that I had landed in one of the most beautiful cities in the world with perfect weather, fantastic friends and a unique atmosphere like no other – it was my dream city. Granada is definitely a city of two sides, which, as a lover of history and Spanish traditions, but also as a young student who adores the feel of a big busy city, was perfect for me! There was the rustic historic side of the town, up around the Albacin and the Plaza Nueva you could find cutesy souvenir shops, tea houses and – my favorite of all – the Arab baths. Then I could head 20 minutes down the road and find myself in Granada’s bustling commercial centre, with excellent shopping and restaurants next to shiny, clean, marbled plazas, and the refreshing splashing of public fountains. Exploring Granada one Adventure at a Time! I cannot think of a better way to describe this magical city. There is never a dull moment in Granada! The history and culture of this incredible city is visible everywhere. 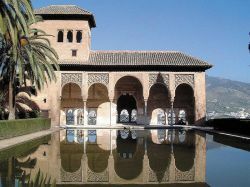 It is so easy to discover new things in Granada that it is an adventure to live and study there. I just returned from studying Spanish in Granada and I have taken away so many life-changing memories from my experience there. I stayed with a wonderful Spanish host family on the main commercial street in Granada, Calle Recogidas. I really enjoyed my easy walk to the school in the cool of the morning as I could see the snow-capped Sierra Nevada mountain range in the distance. I would always take the long way to school by navigating my way through the maze of narrow cobbled streets. In fact, if you look close at the little metal posts along the sidewalks, you will see that the tops are cleverly carved into the shape of una granada (a pomegranate). 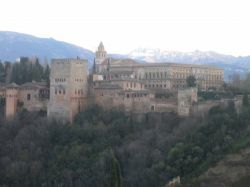 Why you MUST go to Granada! I admit it. It was peer pressure pure and simple which initially made me go to Granada. I have been fortunate enough to visit most of the main cities in Spain and have enjoyed my time in every one of them. However, Spain was not somewhere I would normally have considered going to on holiday (as a French speaker, I usually prefer to go where I can put my language skills into practice!). All this changed when I realised how many of my friends, neighbours and colleagues had visited Granada and how every one of them had been blown away by the stunning beauty of the city! 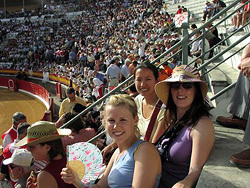 Why my year studying Spanish in Granada was unbeatable! The first line of the Granada chapter of my Rough Guide to Spain reads, “if there is only one place you visit in Spain, make it Granada”. And my Rough Guide, as usual, was spot on! I had the time of my life in Granada! There is so much that I loved about the city it is difficult to know where to begin. Everywhere you look there is some amazing sight or another. From the beautiful Alhambra Palace, to the snow-capped mountains, lively fiestas, flamenco dancers and the caves at Sacromonte, Granada has everything you could dream of. 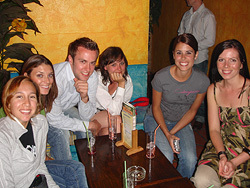 And don’t forget, Granada has a fantastic social scene, and the biggest and best tapas in the whole of Spain!